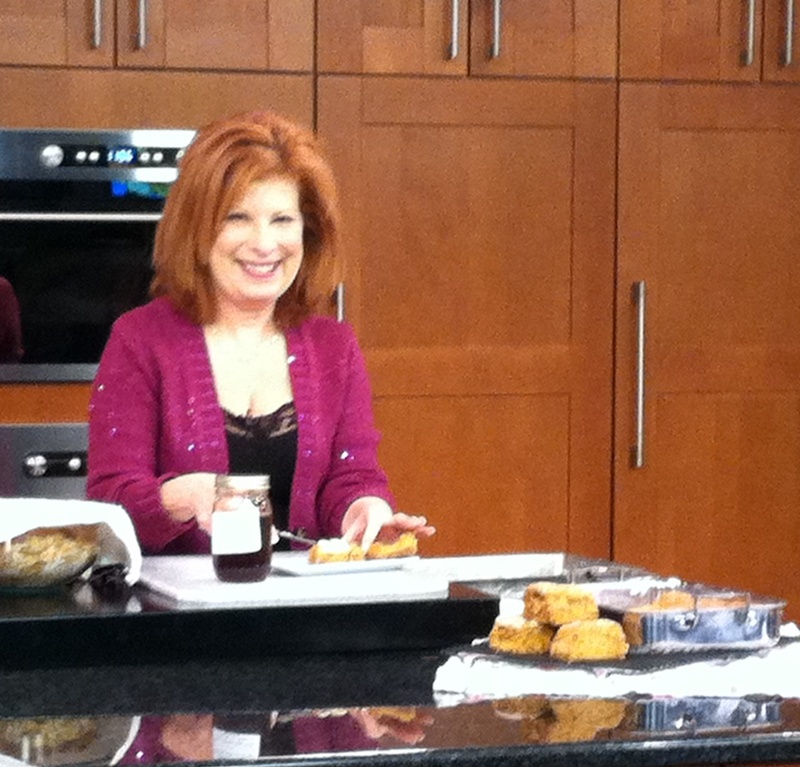 Yesterday Jan 9, I was on WCNC’s noonday show Charlotte Today for my monthly cooking segment. The recipe was for my Oatmeal Molasses Rolls made with local NC sorghum molasses. The spin yesterday was about the local molasses, and a great winter recipe for breakfast or an afternoon snack and how baking is a great snow day activity to enjoy with the family. Heidi Billotto in Panther gear, suited up for the best tailgate ever! Today, as I post the recipe and video, the spin has changed just a bit. With all of the football fever that is filling the air as we approach the big game this Sunday with the 49ers, the spin is now on great tailgating fare; and these terrific yeast rolls are just the thing for your favorite cold cut sandwich, sloppy Joes or as I suggested on the show, simply slathered with butter and local molasses. 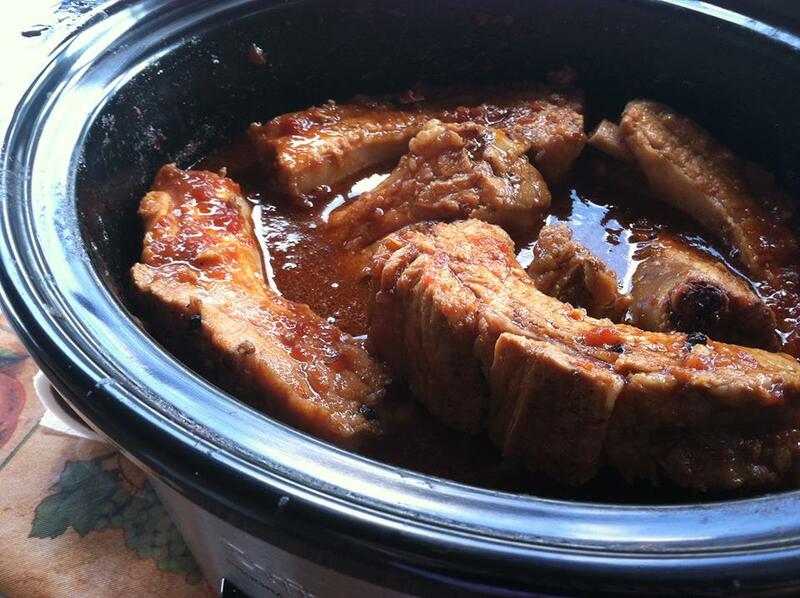 As we cannot live on bread and molasses alone, after the roll recipe here, I also share three other recipes perfect for every Panther Tailgate: Two winter soups from one of my cooking classes and a great slow cooker rib recipe ( and video) from an October spot I did on Charlotte Today. 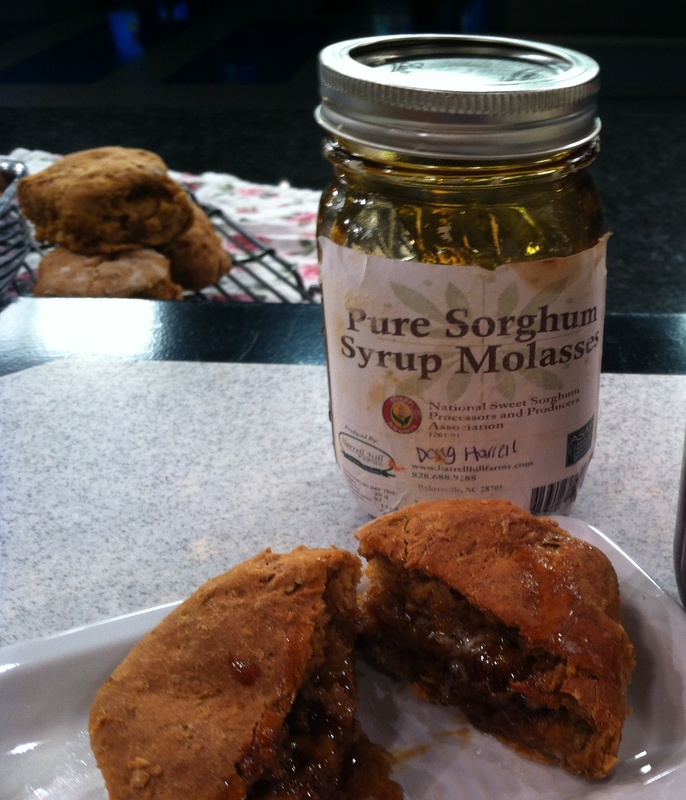 The rib recipe, in a happy coincidence, also calls for local NC sorghum molasses!. As I mentioned on the show yesterday the molasses I used was local product from the NC mountains – Pure sorghum syrup molasses from Harrell Hill Farms in Bakersville NC ( www.harrellhillfarms.com) Sorghum molasses is a sweet syrup made from young sugar cane with more of a robust flavor than honey, but not the bittersweet almost burnt taste that is found in blackstrap molasses. Molasses is a by-product of the sugar industry, whereas sorghum is the syrup produced when the extracted juice from the sorghum is boiled down to a thick sweet mass. Blackstrap is found in most grocery stores, but the hunt for local NC Sorghum is more exciting – you’ll find it direct from producers like Harrell Hill, and at local stands in and around the NC mountains – when you find it buy several jars so you will always have it on hand. in making these rolls , just a few words on yeast – its what make the rolls rise so you want to be sure its good. The way to do that is to proof the yeast. In proofing yeast, as soon as bubbles begin to form on the surface of the water you are good to move forward with the recipe. Yeast is a living growing organism and water or ingredients that are too hot will kill it, so take care that all of the ingredients you use are at room temp. to proof the yeast just take a cup of water and add the year and give it a stir – you can add a touch of sugar if you would like, but it will proof with out it. After you stir in the yeast just look for bubbles to begin to form on the surface – once you see the bubbles you are golden and can move ahead with the recipe. if there are no bubbles then either your yeast was old or the water was too hot – its okay, just smile, pour it out, and start again with cooler water. Combine oats and boiling water in a large bowl. Let stand 20 minutes. 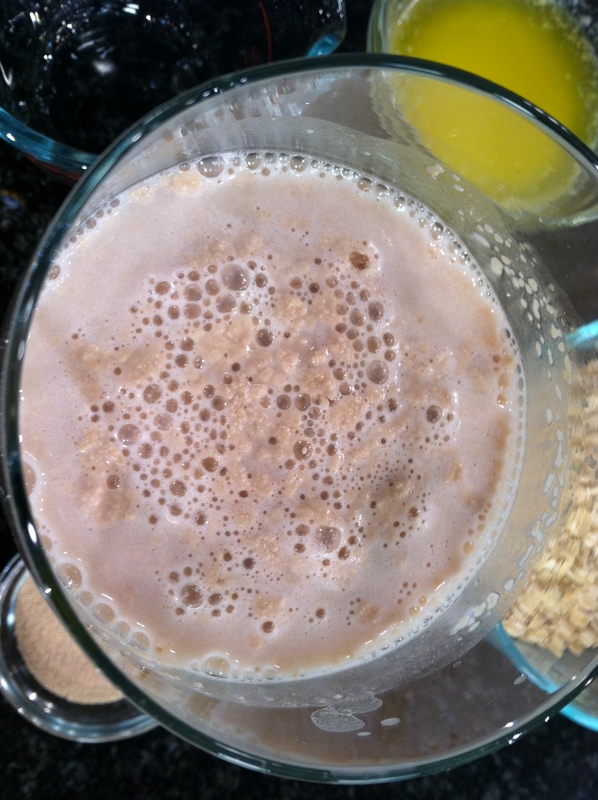 Proof yeast in warm water; and add to cooled oat mixture. Add molasses, salt, butter and flour. Knead until smooth. Let rise until doubled,1 to 1 1/2 hours. Pat dough down, roll out 1 ½ to 2-inches thick. Cut into rounds. Place side by side in a 9×13-inch buttered baking pan. Let rise 30 minutes. Bake 20 minutes in a preheated 400-degree oven. Let the rolls cool slightly then enjoy hot slathered with butter and drizzled with more of that local NC sorghum molasses – yum! For loaves of bread, bake 50 minutes at 350 degrees. Two soups to accompany the roll recipe – the first from my dear friend Pat Walker – a scrumptious mushroom and brie soup – the other a vegetarian chili recipe I developed for my husband Tom Billotto – both freeze well, can be reheated and travel well to game day sites packed up in a thermos or insulated container. Sauté mushrooms in 2 Tbsp. butter; add onion, thyme and bay leaves. Sauté until moisture evaporates – about 5 mins. Add wine and cook until liquid reduces by half. Stir in stock and cream. Bring to a boil, reduce heat to low and simmer 30 minutes. Melt remaining butter in small pan, whisk in flour. Cook on low heat to form a roux. After soup has cooked 30 minutes, remove bay leaves. Cut Brie into small pieces and add to soup, melt. Add roux in small amounts until soup thickens. Add salt and pepper to taste. Sauté the minced green pepper and dried pepper flakes in olive oil over high heat until lightly browned and limp. Add minced mushrooms and carrots and sauté 3-4 minutes stirring well. Add tomatoes, kidney beans, chili powder and cumin. Blend well; reduce heat to low and simmer 15-20 minutes. Season to taste with sea salt and pepper. VARIATION: For chili cheese dip: stir in one (8 oz.) block cream cheese and a four-ounce portion of Velvetta processed cheese. Stir chili until cheese melts. Combine the barbecue sauce ingredients in a saucepan and simmer for 30 minutes or so. Cool slightly and then puree. Taste to adjust seasonings. Season ribs with salt and pepper. The rub well with sugar. For sweeter ribs use dark brown sugar. Allow to stand while you make the sauce. Place the ribs in a slow cooker, fat and meat side out facing the wall of the cooker. Pour the sauce over the ribs and cook for 6-7 hours keeping in mind that local ribs will cook faster than commercially raised ones. For more of a caramelized finish, place cooked ribs under the broiler for five minutes or so just before serving. Next Post: Going Gluten Free? Here’s a great North Carolina Chestnut Flour bread recipe you’re gonna love! yes Brenda Sutton – they would be delicious!